Discussion in 'Google TV General Discussion' started by Wisdom, Jul 10, 2013. Aereo's streaming television service is coming to your game console of choice as well as Google TV and Android devices starting on July 10th. The service kicks off in New York City, Boston and Atlanta on July 10th, with 20 more cities planned for expansion this year (including major locations like Baltimore, Chicago and Philadelphia). It won't arrive in the form of a standalone app, however -- the service is launching through an existing channel: PlayOn. Live TV fans who want to cut their cable cord can access Aereo with PlayOn by using their PC to get things set up; you'll also need an $8-a-month Aereo subscription to access the 60-plus live TV channels available. Oh, and a PlayOn subscription ($50 for life or $25 / year). Nothing quite says "simplicity" like a puzzle of subscription plans! Update: Aereo emailed us to say, "Aereo has no business relationship with PlayOn." Apparently PlayOn's announcement this morning came without any heads up to the folks at Aereo, and it's unclear just how well Aereo's service will work using PlayOn. We've reached out to PlayOn for a statement as well, though we've yet to hear back. Update 2: PlayOn got back to us with the following statement: "PlayOn does not have an official relationship with Aereo, just as we don't have official relationships with most of the channels we support. PlayOn is an award-winning software product that runs in the background on your PC and allows you to then stream content from supported sites to your set-top boxes (such as Roku), gaming consoles, and/or mobile devices. It is a solution that does not require a relationship with content providers as all PlayOn does is shift which screen you are using to watch content which is, for free or via a subscription, already made available to you through your PC Browser. To utilize PlayOn's Aereo channel users still need an Aereo subscription and to live in one of Aereo's coverage areas." 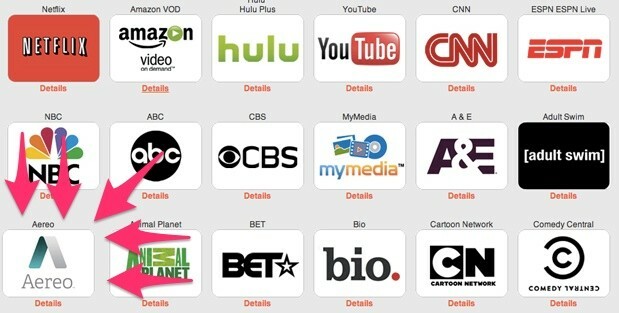 The "boasting" by Aereo that you get 60 channels is misleading. I know some people use PlayOn to enhance their GTV experience - but I for one didn't buy into GTV to have to use a "computer workaround" to get content on my TV. I believe it's going to be sweet dude, something new ....! Just curious - why do you think it's a good deal? You can get all those channels for free with an antenna. Plus it requires the hassle of also having a Playon subscription and using a computer. If I could access all of those channels with an antenna - I wouldn't waste my internet bandwidth to view them. Also the cloud DVR will drain internet bandwidth, For someone whose ISP poses internet caps this is certainly not ideal. Anyway it's currently only available in 3 cities. I am a big PlayOn fan and use it along with the PlayLater DVR service, primarily for Hulu access, but I sure won't pay for Aereo since I can receive the local channels with an antenna and TiVo. I did notice Aereo was added to the PlayOn channel list but I agree with Catfish this is good news for a very small group of users and that is assuming Aereo prevails in the court battle.